Vintage garden decorations are becoming a growing trend for the outdoors these days. Incorporating quirky antique and vintage pieces into your yard will give your home facade a unique look, something that no one else in your block have. So if you have a garden at home and you think it lacks some character, then consider decorating it with vintage and antique pieces. Perhaps, you can adorn your garden with vintage chairs or rustic inspired furniture pieces. You can also adorn your yard with recycled materials that will surely convert your outdoors from a boring space to a gorgeous one. Here are some fantastic vintage garden decor ideas to incorporate for your own yard. Accessorize your garden with a beautiful wooden cart if you want to give it a vintage flair. You can choose to build one if you are creative enough and that you have some knowledge on carpentry work. However, if this option is not possible for you, then visit one of the salvage shops near you. There might be some old wheelbarrow or garden carts that you can recycle to be used for your garden decoration. You can choose to paint the wheelbarrow with dark colors. On the other hand, you can leave it as is, depending on the kind of look that you want to achieve. 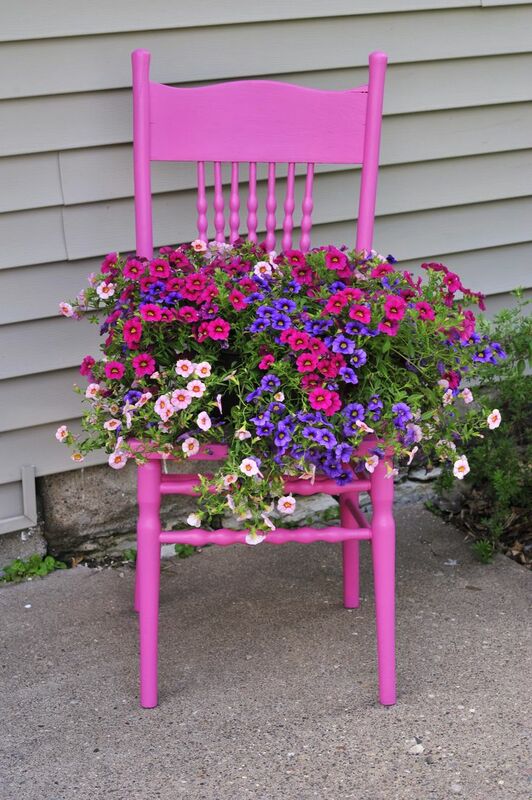 If you want to add some colors in your dull looking yard, decorate it with a beautiful repurposed chair. You can leave the antique chair in its original color. However, if you want your garden to be more colorful, paint it with a bright color of your choice. On the other hand, you can choose to leave the chair in its original color. If you want a vintage flair, then look for antique chairs made of cast iron and other similar materials. An old recycled bike would be one of the most beautiful vintage garden decorating ideas to incorporate in your garden if you want to give it a vintage flair. This decorating idea should not cost you a lot of money. You can simply visit any of the recycle centers near you to purchase an old bike. On the other hand, you can check with your neighbors and see if they have an old worn out bike that you can buy. Paint the bike in the color that you want. Perhaps, you can go all black similar to the photo above. Decorate it with flowering plants to bring in more life into your garden. A hammock in a garden sounds really interesting. Thus, decorate your garden with a beautiful retro inspired garden hammock similar to what you see above. With this hammock, you will not only make your garden look more vintage. It also gives you an opportunity to relax after a hard day’s work. If you are into fairies, angels and the like, then consider decorating your garden with this antique looking angel sculpture. Sure, this might be one of the most expensive antique garden accessories to have. However, investing on this sculpture is a great idea if you want to give your garden a vintage flair. This garden accessory is guaranteed to last long since it is made from durable materials. Thus, your investment will really be worth it. A wicker pram will surely make your garden to look even more beautiful. This is one of those vintage garden decorations that’s guaranteed to give your garden that beautiful vintage look. Moreover, this accessory is not too common. Therefore, having this will surely make your garden to stand out from the rest. You should be able to find this from a local antique shop or recycled center and should not cost you a lot. If you want a lighting accessory to decorate your garden, then this vintage garden lamp made of steel would be perfect. This is one of those vintage garden decorating ideas that will make your garden to stand out especially at night. So, if you’re someone who loves entertaining guests in your garden or patio, then this lamp is a perfect accessory. You can simply light candles inside and you’ll have a romantic and cozy ambiance in your garden. If you’ve got a tree in your garden, then consider hanging this beautiful vintage inspired bird cage on it. You can also place some birds inside and not just use it as a decoration. Perhaps, a pair of love birds would be perfect inside. 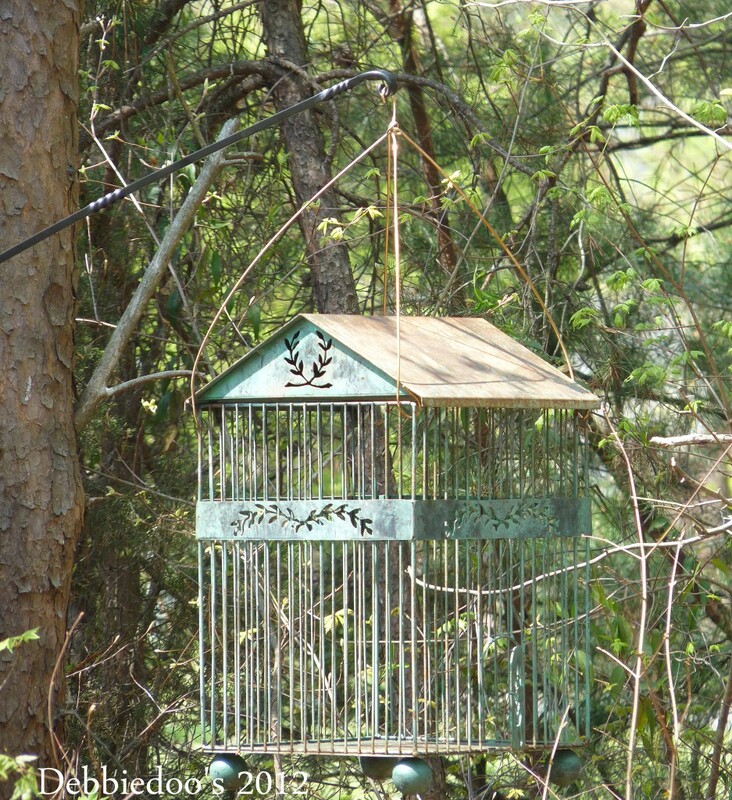 Again, a perfect place to look for this rugged looking birdcage is at a scrap shop or recycle center. Another beautiful garden sculpture that can give your garden that vintage flair is this vintage cherub sculpture. These concrete structures are among those vintage garden ideas that can make your garden to stand out. 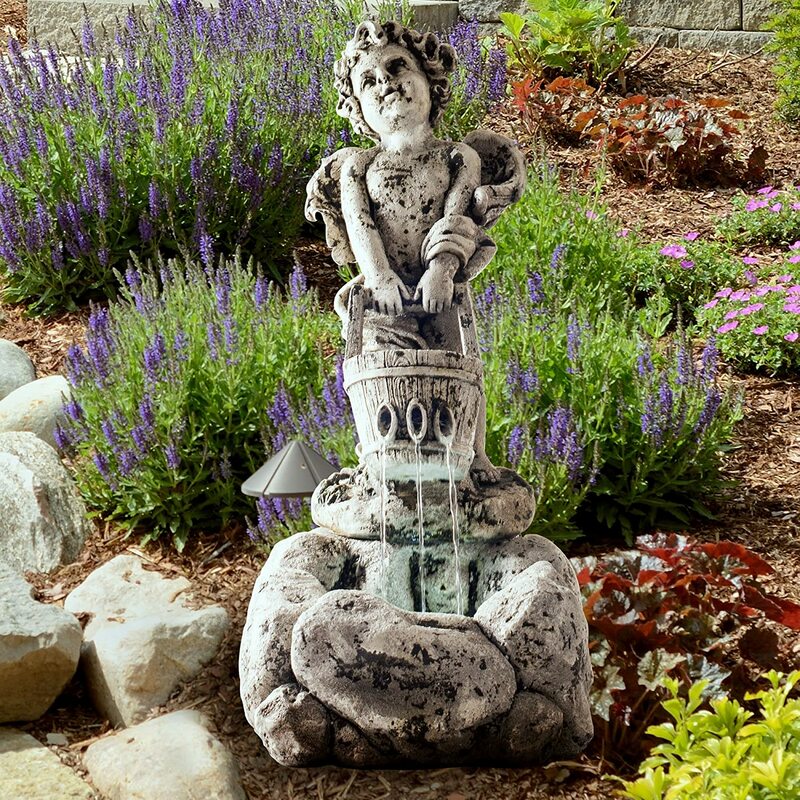 You can also look for those cherub structures that have water fountain for an added flair. Install it near your flowering plants and your garden will surely be the envy in your neighborhood. 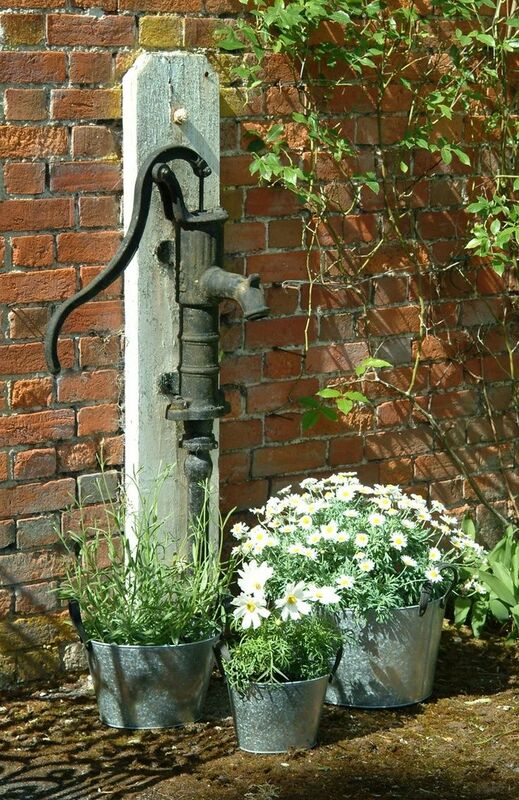 Another unique garden accessory is this antique water pump. It will surely make for a great focal point in your garden. There are lots of these water pumps at some antique stores so you can get one of them. Attach it on your garden wall and place some flowering pots beside it. That should be enough to give your garden a vintage flair. 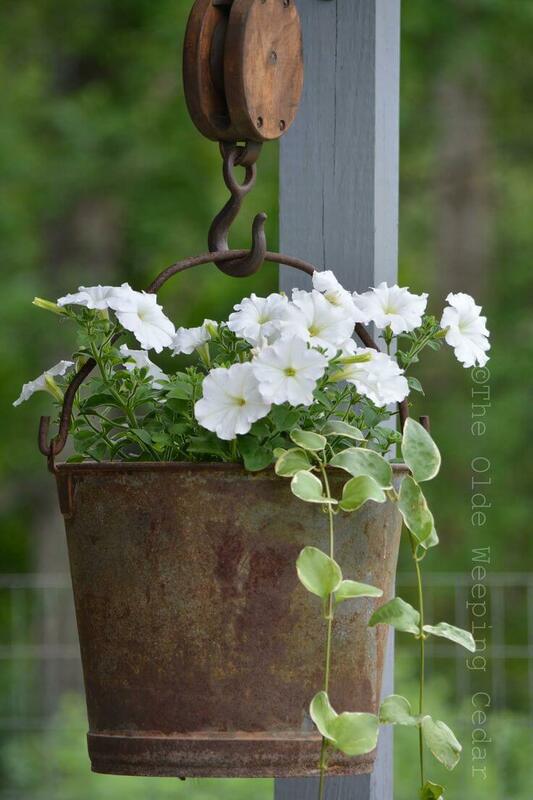 Another garden accessory that you can salvage from a scrap shop is this rusty antique metal bucket. You can use the bucket as a planter. Or better yet, hang it in a hook similar to the photo above so you will have a beautiful plant hanging in your garden. If you can’t find an antique looking bucket, consider buying a new metal bucket and paint it in bronze. 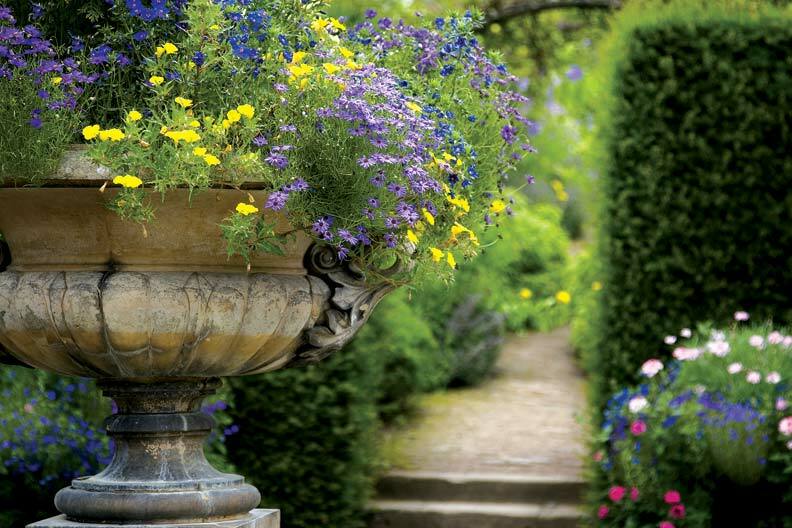 A beautiful antique garden urn that’s filled with colorful flowering plants would make your garden look fantastic. The urn can also be placed near your front door entry to welcome visiting guests and make a good impression. The urn can be bought from your local garden centers or you can have it custom made. This rusty wheelbarrow will not only make for a perfect garden accessory, but can also be used as planters for some of your flowering plants and shrubs. 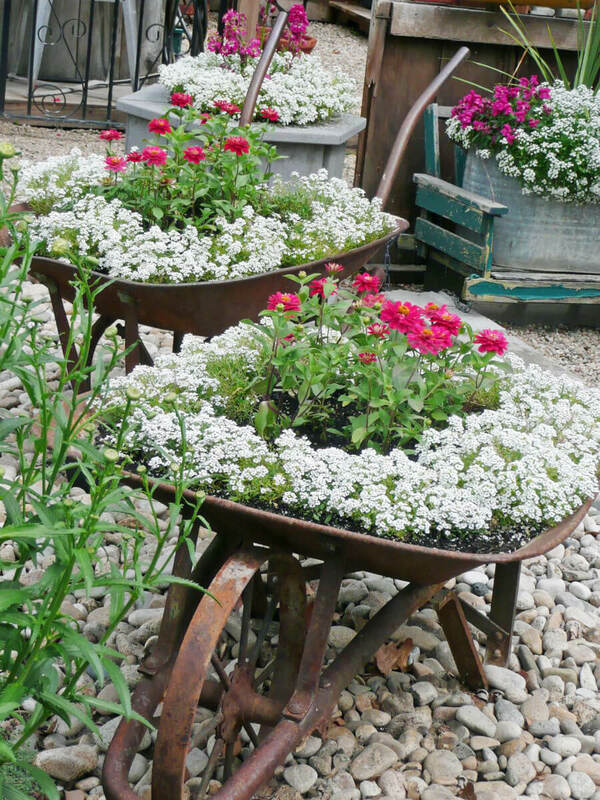 Since the wheelbarrow can be salvaged at a scrap shop, this is one of those vintage garden ideas that will not cost a lot. If you want to have a coffee table in your garden where you can relax and entertain some guests, this antique table and chair is a great idea. With this beautiful furniture set, you can take your guests a walk in the past the moment they step in your garden. Looking for repurposed steel garden furniture should be easy. Perhaps, you can visit antique shops or any furniture center to look for old furniture pieces that look worn out. 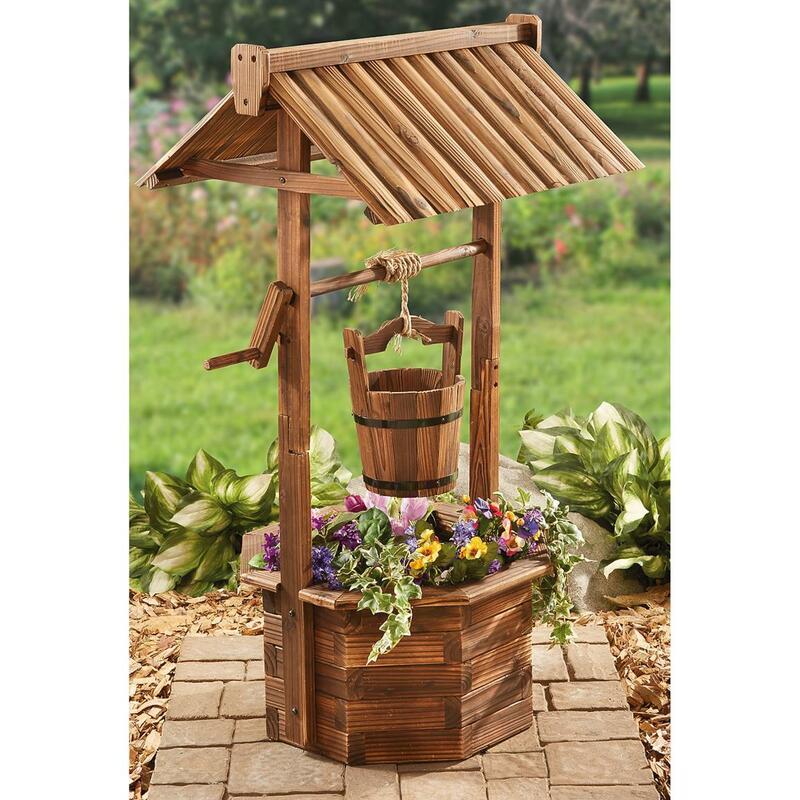 Another beautiful decorative piece that can help to make your garden look even more beautiful is this wishing well made of wood. This is one of those vintage garden decorations that can also double up as a planter. Made from natural wood, the rustic look of this wishing well can add a vintage flair to your garden. The bucket in the middle can also be used to hold multiple plants. Water fountains made of cast iron can add a historical touch into your garden. To achieve a vintage flair, you can go for bronze or brass water fountains. Aside from fountains, you can also go for other sculptures such as fanciful mermaids, leaping dolphins, giant tortoises and other structure pieces. These antique garden accessories are highly durable and can also make for a perfect focal point in your garden. This Victorian garden bench is the perfect garden accessory to decorate in your garden or patio. As you know, Victorian era is all about medieval and Gothic Revival in all the aspects of design and architecture. This garden bench made of cast iron is not only a decorative piece, but is also a useful piece of garden furniture that can be used to entertain visiting guests. Moreover, the bench is also a perfect place for you to relax and unwind after a hard day’s work. These antique copper garden planters can be perfect for both outdoor and indoor decorations. With its worn out look, it can help to add a vintage flair to your garden. The planters are extremely durable and can last even up to several generations to come. You will find these in antique shops, but if you want a cheaper variety, do check out your local garden center that sells antique planter replicas. This face mask hanging planter is made entirely of wood and can make for a perfect accessory on your garden wall. You can also use it as a planter, where you can plant evergreens or some flowering plants. It can also be used as indoor decors or can be hanged outside to watch over your yard. Another smart and practical way to decorate your garden is using upcycled and reclaimed tub as planter. You will surely not have a hard time in looking for old tubs with worn out look. They can be salvaged from scrap shops and they do not come with a hefty price tag. Thus, if you want a garden decor that will not cost you a lot, then this would be perfect. You can install it along with your evergreens and you can also include flowering plants to give color in your garden. With its ample space, you can have several plants planted in this tub. Last but not the least, is this rustic garden swing made of iron. This decorative piece will sure to give your garden a beautiful vintage flair. It is also a great way to relax and enjoy the beautiful views of your outdoors. It is very durable and can last for several years to come. Hopefully, these vintage garden decorations can inspire you to come up with a vintage inspired garden design.